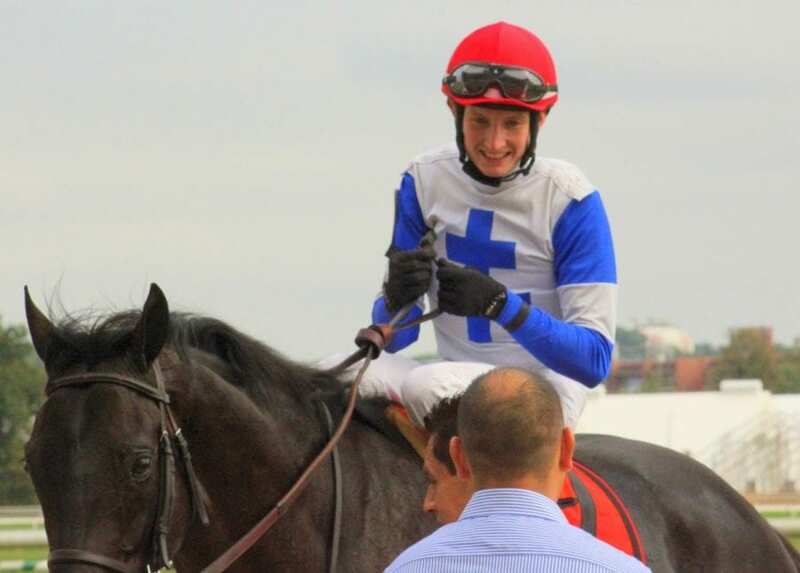 Jockeys Trevor McCarthy and Jevian Toledo, who have combined to win the last four overall riding championships in Maryland, got tangled up in the stretch during Thursday’s third race at Laurel Park that saw McCarthy avoid injury after briefly landing on the back of a rival horse. McCarthy was aboard 3-year-old Galileo filly Decorating, a Glen Hill Farm homebred favored in the 1 1/16-mile maiden special weight, and making a sweeping move on the outside from mid-pack into contention around the far turn, as Toledo and Gunpowder Farms’ homebred Benevida raced alongside. Toledo and Benevida moved into McCarthy’s path approaching the eighth pole in an attempt to avoid a drifting Dumtadumtadum and jockey J.D. Acosta, who were ahead racing in third. Benevida and Decorating made contact causing McCarthy to fall to his left and land on the back of Benevida, staying on for several strides before dangling between the two horses and then falling to the Exceller turf course. McCarthy is aboard #10 in orange, white, and black silks. Decorating stayed up and finished the race and was caught by an outrider past the finish. Stewards disqualified Benevida from sixth to last in the field of 10 for interference. Phillips Racing Partnership’s Soar From Shadows was a 1 ½-length winner, the first of two turf wins on the day for jockey Feargal Lynch. After moving his tack to New York for the winter and spring, McCarthy is back riding full-time in Maryland, where he topped the overall standings in 2014 and 2016. Toledo was Maryland’s champion rider in 2015 and 2017.